If you check your Bible, you’ll probably see a dozen additional verses, but if it is a scholarly edition, you’ll also see a note that indicates those extra verses are doubtful. Scholars believe the extra verses were added later. The Gospel of Mark originally ends starkly -- in uncertainty and fear. Maybe the ethical movement founded by Jesus will continue. Yet it’s clear that fear of political repression will be an ongoing reality for that movement. With fear and great joy. In Mark, the women were simply scared. This time they have a mix of fear and joy. A key point here is that in Matthew, but not in Mark, there are guards. Mary and Mary can see that the guards are scared stiff. If the Roman guards are scared, then this white-clad guy is evidently not, himself, a Roman agent. So the political repression fear that was predominant in Mark is mitigated in Matthew. Some of Jerusalem's rulers catch wind of the news that Jesus' body has gone missing. They concoct a story, which they bribe the guards to affirm, that some of Jesus' followers came in the middle of the night and took the body away. Only in Matthew do we get this strange little story about bribing the guards to say, “His disciples came by night and stole him away while we were asleep” (28:13). Maybe that’s exactly what did happen, and the Matthew storyteller is trying to discredit that by attributing it to the lies of bribed guards. 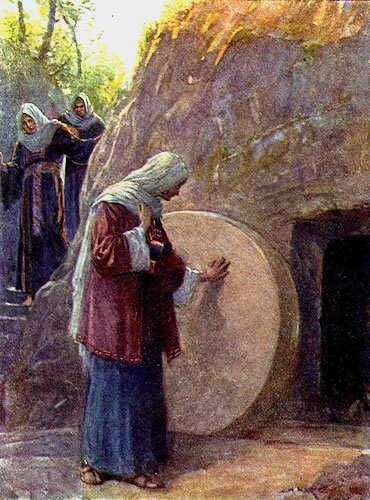 Still, overall, Matthew's is the most straight-down-the-middle Easter story of resurrection. The fundamental optimism is much clearer than in Mark. Yes, there are still some swirling political realities that put Jesus’ followers at risk -- but the basic point is the good news that Jesus did not really die. Part 2 of "What's the Meadow For?" Next: Part 3: "Luke Easter Story"